Mother Nature has been very kind these last twenty four hours. The swells of waves during the night were small and steady. 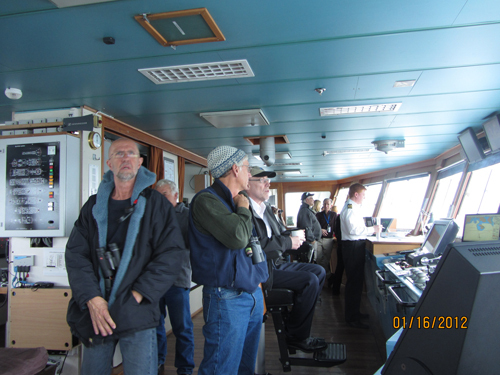 Once again the ship rocked the passengers to sleep as it climbed up one wave and slid down its back side. 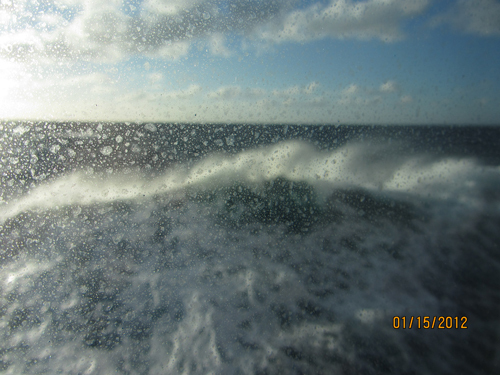 The only sound to be heard was the splash of the waves as they were thrown away from the side of the ship. The birds had retreated by this time signifying that we no longer were near land. 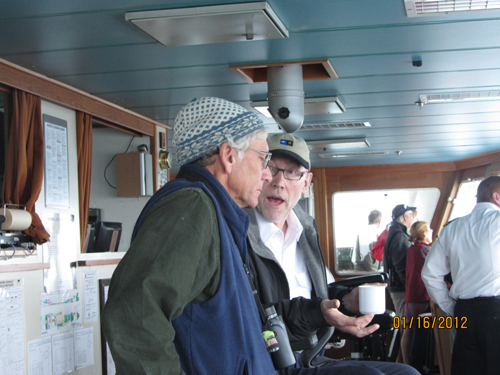 We were now alone to sail through the Drake Passage on our way to Cape Horn. Morning brought a whole new venture. The Drake had been resting during the night in anticipation of giving us a show of strength as the early morning hours approached. Not wanting us to go home without experiencing some of its strong reputation, it turned its wave machine on in time for breakfast. A true "Rock and Roll" sidestep became the method of walking. 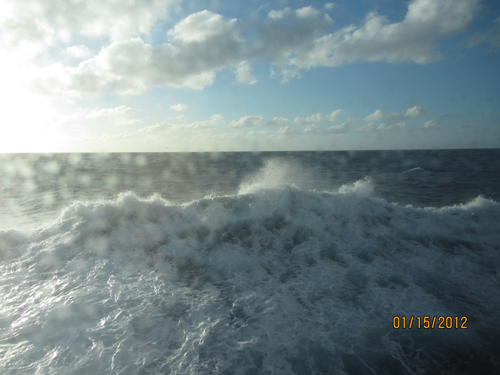 The ship as steady as it has been is no match for the giant waves beating against it hull. 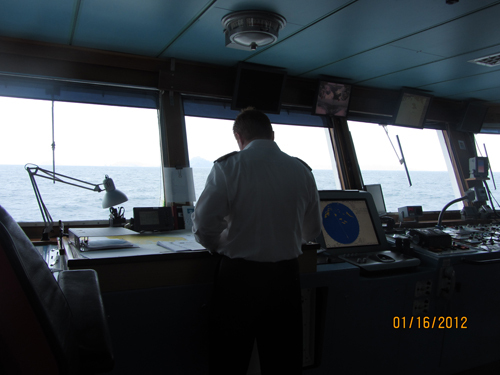 The captain has done a magnificent job of guiding us through this turbulent water, but he still has to stay on course. The ship finds itself climbing high up a wave only to be pushed off the top into the valley below. This sudden drop causes a definite change in gravitational pull. One is no longer securely attached to one's chair. One is also not very confident that the coffee in the cup is going to stay there until the cup is raised to the mouth. A job of predicting when and how to drink has become a breakfast game. The Drake has turned the day into one of "dancing through the ship" with everyone young and old, short and tall, strong and weak, grabbing for anything nailed down to prevent flying through the hallways in the opposite direction of the intended way. The course has been set to go due north until Cape Horn after which the ship takes a sharp turn east and heads to the entrance of the Beagle Channel. 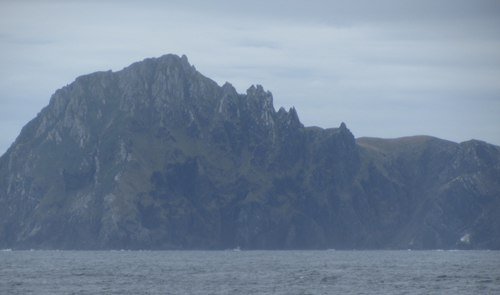 Cape Horn is the southern most tip of South America and is "owned" by Chile. 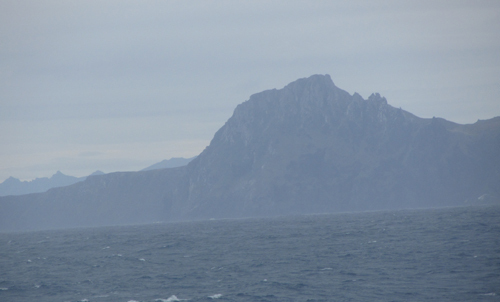 There is a small military station on the island of Horn along with the monument. The turning of the ship to the east puts the churning waves to the rear. The ship no longer has to climb the high embankment of a wave only to drop off the "wave cliff" to the valley. It now gets to cruise along at a more steadier pace within the vortex of the waves.